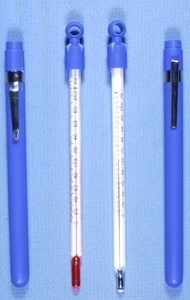 Pocket Glass Thermometersare widely used in chemical, pharmacy, brewing and mechanical manufacturing. Meanwhile, they are also excessively implemented in lab of scientific research institutes, education systems, etc. Specifications︰ The Pocket Thermometers's measuring range is between -30 to 500 degree C, and organic liquid-in-glass thermometers' range is -100 to 200 degree C coding with red or blue color.